If your company intends to manufacture tobacco products within the United States, you may be required to obtain a federal permit from the Alcohol and Tobacco Tax and Trade Bureau (TTB). Additional manufacturer or distributor of tobacco products licenses may be required by state and local authorities depending on where the tobacco will be sold. 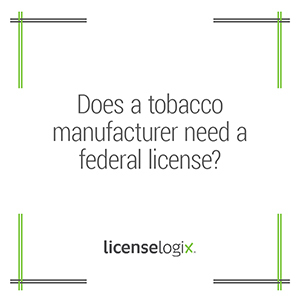 Federal law requires that all businesses who intend to manufacture tobacco products obtain a permit from TTB. To apply for a permit to manufacture tobacco products, you must complete a detailed application, a personnel questionnaire for each officer, director, or stockholder of more than 10 percent, provide a diagram of factory premises, and obtain a surety bond. Failure to secure and maintain proper licensing could potentially incur civil fines, or the imposition of criminal penalties. Licenselogix can help you obtain all necessary permits to ensure that your company is in compliance with federal, state, and local licensing laws. Our skilled account managers will identify any supplemental information needed, collecting and completing all paperwork and applications, and monitoring the process to ensure swift approval so that you can focus on growing your business. To get a free quote today, fill out the box on the right or call us at 1-800-292-0909.